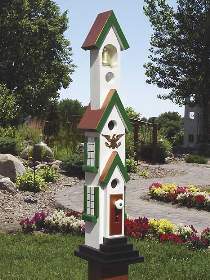 A garden decoration with the appearance of a birdhouse. Make it from standard lumber sizes. All patterns drawn FULL SIZE. Measures 30”H. Order bell, brass eagle and ceramic knob separately or see Special which includes #W2991 Bell Tower Birdhouse Plan, #9263 Bell, #5901 Brass Eagle, and #1662 Ceramic Knob.